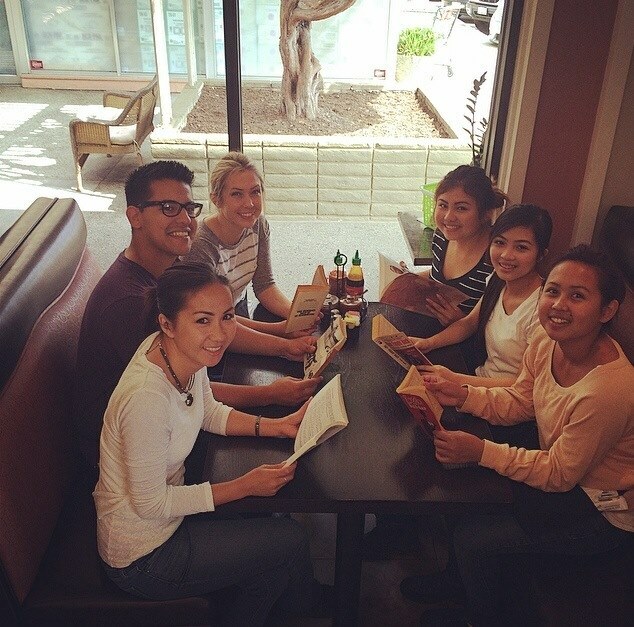 Here are Vi Le, Co-Manager of Noodle Bar in Marina, and her team, grabbing a moment to read before the Sunday lunch rush. "When I was a child, I attended Vietnamese classes in the back room at the little old Marina library in Seacrest Shopping Center. I could speak Vietnamese from my family, but my parents didn't teach me to read and write the language. A wonderful teacher named Mrs. Le (no relation) taught me those skills. Every Sunday morning, I'd show up at the library with my little white board, and I would write Vietnamese words and erase them and write them again. I was seven and eight years old during those classes. I think I was the youngest person in the room, but Mrs. Le was such a wonderful teacher, I always felt comfortable. During the week, she was a teacher at Los Arboles Middle School. Mrs. Le still holds a dear spot in my heart." Vi and Joe Augusta, her fiancee and her partner in managing The Noodle Bar, don't have much time to go to the library. They are too occupied running the busiest restaurant in Marina.